In fact, fall is a critical time of year for the bees. SugarCreek’s Beekeeper, Pete Motza, has been closely inspecting the hives to ensure they can withstand the hardships of winter. That means making sure the queen is healthy and that the bees are adequately fed so they can make and store enough honey for the cold winter months. Bees should have around 60 lbs. of honey stored in their hives to survive the winter. A beekeeper's job is vital, as the hives must be set up to resist the winter weather while still maintaining proper ventilation to reduce humidity. Two out of SugarCreek's three hives are thriving and are on track for winter preparedness. 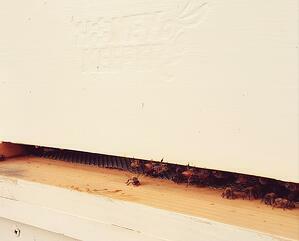 Unfortunately, the latest SugarCreek hive inspection revealed that out of the three hives, one queen had been lost. The most common causes of a queen bees death is disease or attack by a predator such as hive beetles. The best case scenario is that the bees raise a new queen themselves, but more likely is that a new queen will need to be introduced from an outside hive. While it is Beekeeper Pete’s responsibility to assist in winter preparation, the bees do the majority of the work. Bees keep themselves, and most importantly the queen, warm in the winter by forming themselves into a ball and vigorously vibrating their wings. The average temperature at the center of a winter cluster of bees is a toasty 92 degrees F! The further a bee is from the center, the colder they are, and bees actually take shifts at different parts of the cluster if they start getting too cold or too tired. Bees are constantly working to ensure the survival of the hive, so it is easy to understand where the phrase “busy as bees” comes from!